Finally, a Thousand Trails park I actually liked! 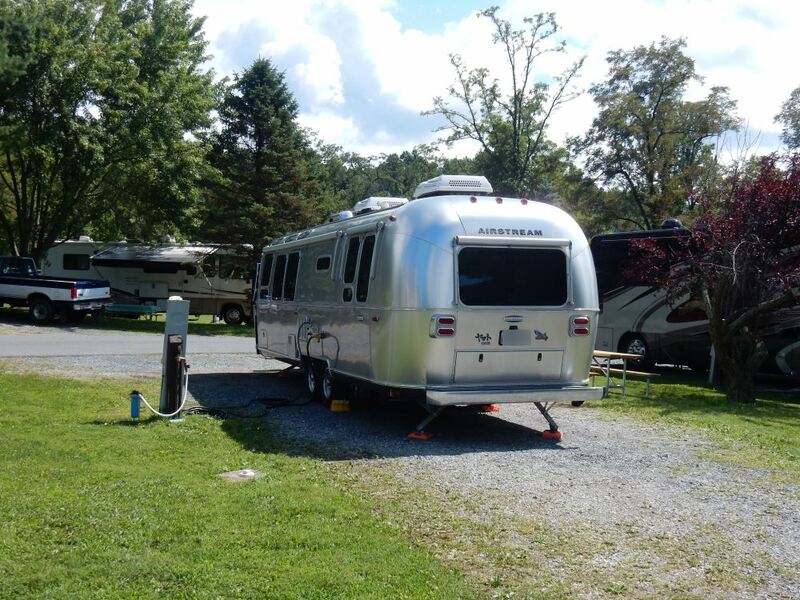 Hershey RV is a cut above the other North East parks in its family with good sites and well-maintained facilities. Here is our lovely trailer parked at the lovely park. They gave us chocolate kisses on arrival. After a series of disappointing stays in Thousand Trails campsites, we finally found one that I can honestly recommend as a good park. Hershey RV seems to have a solid management team in place and as a result, it is a clean and well-run park. The rolling hills on the park ground make for a more private feeling than in many other parks but are not so steep as to pose an obstacle to navigating your RV. The grounds are well kept and include some great lawns for kids to play in or to have a picnic. A small lake allows for catch and releases fishing, and there were numerous events scheduled each day for both kids and adults. Some of the sites do have a bit of a slope to them due to the hills, but nothing out of the ordinary. The gravel pads were reasonably level. A nice view across their recreational lake. For the first time in a TT park, I found the bathrooms to be in good shape. There was even a cleaning schedule on the wall that showed they were serviced twice a day over the past two weeks, and it showed. In keeping with other TT parks, they have a pretty full slate of amenities on offer with a decent sized pool, two clubhouses, and food service. I can happily recommend Hershey RV to anyone and especially if you are a Thousand Trails member as it can make for an inexpensive stay at this quality park.